This week, our Face of SaTH is Richard Stephens, who is a Kaizen Promotion Office Specialist. “Following retirement from the Royal Navy in a senior management role and completion of a Sport Science degree and various coaching courses, I initially joined the Trust in Therapies working as a Therapy support worker. 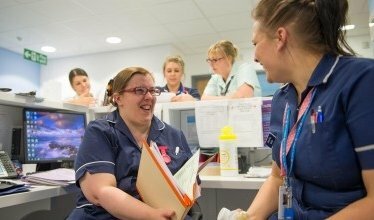 On completion of a Level 3 in Healthcare, I quickly progressed to be part of the Early Supported discharge team for Stroke as a part-time Assistant Practitioner responsible for delivering therapy in Physio, Occupational Therapy and Speech & Language Therapy. “I joined the KPO (Kaizen Promotion Office) team in 2016 as a Specialist and have since completed my Advanced Lean Training with the Virginia Mason Institute, and am accredited to deliver week long workshops in both the Workshop and Team lead role. I also have a teaching role, where I am responsible for delivering the Lean for Leaders programme and TCPS Methodology training. Most recently, I completed a Level 5 coaching award, which will enable me deliver coaching to all staff, as part of the wider Trust Coaching team. “I enjoy all aspects of my job as it enables me meet and work with staff from all areas of the organisation and at all levels. 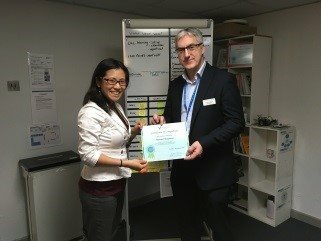 In particular, I get a real buzz at the end an improvement workshop when a team has felt empowered to make meaningful changes to their processes by eliminating waste to improve the quality of care to our patients. “As a qualified personal trainer and a member of the Register of Exercise Professionals, I have been inducting our staff into the gyms located at our hospitals for the past five years. I have taken on this role on a voluntary basis and enjoy imparting my fitness knowledge during inductions to our staff as part of the wider health and wellbeing programme.